Just messing around with watercolor paints. Hey…here is a fun activity for ya. Add your own caption. 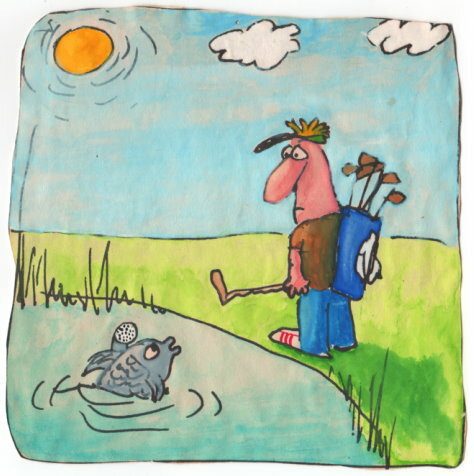 What is this fish saying to the golfer? Is he angry? Irritated and perturbed? Helpful and considerate? Or what? And just for funsies, I will pick the winning caption in one month. Let’s see how funny you are! Thanks for your contribution, Bunk. I guess you are the only one with an imagination! Nice! I’ve been thinking about playing around with water colors myself. It is a lot of fun. Give it a go, Flip!